As is well known, no literature as such survives from the late Bronze Age Minoan-Mycenaean culture, when the Linear B script was used primarily for fiscal and book-keeping purposes, as can be seen in the approximately 5,900 extant Linear B tablets and fragments of tablets. However, this does not rule out the possibility, however remote, that there existed at least a sacral literature, as attested in other ancient scripts of that period, hieroglyphic Egyptian on papyrus, as well as Cuneiform and Hittite on clay tablets. The assumption there was no Linear B literature as such is based on the faulty premise that no literature was recorded on tablets, but it might very well have been on papyrus. The difficulty here lies in the fact that papyrus could not possibly have survived the damp Mediterranean climate of Crete, Akrotiri, Mycenae, Pylos or Tiryns or any other Minoan-Mycenaean town or settlement. So if there ever was a literature, it has long since been lost to us in the void of history. However, one inescapably significant factor mitigates in favour of such a literature, and that is the extremely frequent mention of religious and sacral rights, as well as of almost all the Homeric deities on the Linear B tablets, and this in spite of the fact that the vast majority of the Linear B tablets are primarily concerned, not with religious matters, but with fiscal administration… or so it would appear. Of course, it is absurd to assume that, even if there were a Mycenaean literary corpus (which would have almost certainly been comprised solely of sacral and religious rites, and possibly poetry, had it existed) there would certainly not have been any haiku or anything remotely like it in such a literature. After all, Mycenaean Linear B, being contemporaneous with ancient Chinese (ca. 1,500 BC), antedated Japanese haiku by at least 3,100 years! But, hey, I can at least indulge in the fantasy. 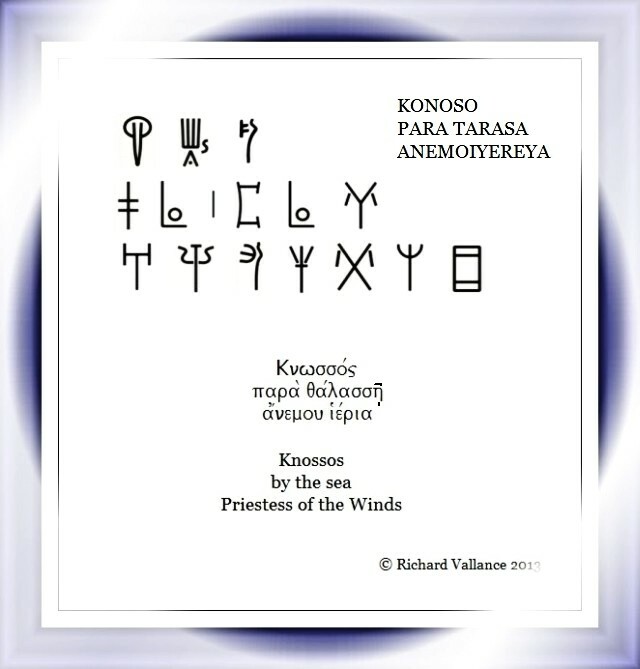 NOTE that Linear B used a vertical bar to separate words, as we can see on second line of this haiku, where the vertical bar separates PARA & TARASA. Interesting Richard….I am taking note. Thank you, Raymond! Glad you like it! I sure had fun writing it.